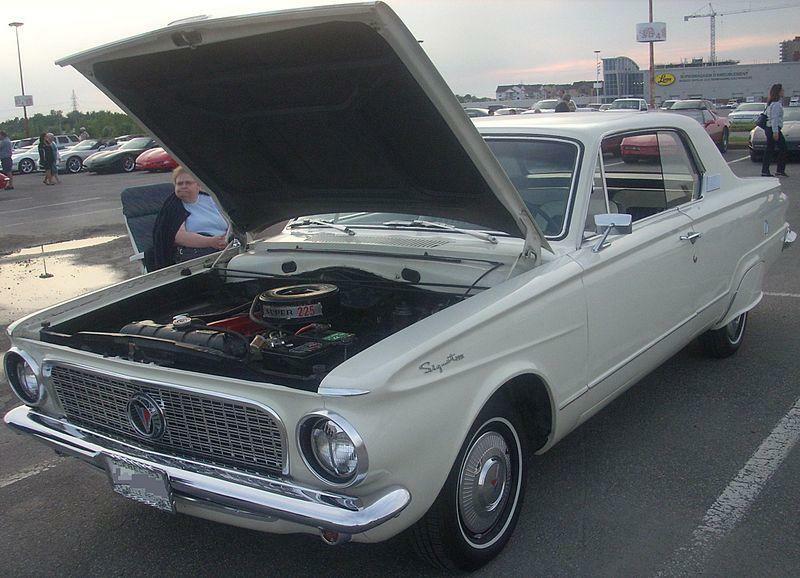 In 1963, the Plymouth Valiant received its first major redesign since its 1960 introduction. Gone were the baroque swirls, curves, and fins, which distilled the car to a very sound and practically bulletproof compact. The 1963 Valiant now sported a trim, squared-up shape with a wide C-pillar, similar in some respects to the style popularized by the Ford Thunderbird of the era. The grille was a fine-mesh upside-down trapezoid and the fender line ran smoothly from the rear to the front, where it curved back over the front wheel and faded out. The V100 was the base car, the V200 had more options, and the V200 Signet was top of the line. All had slant six-cylinder engines of 170 cid or 225 cdi, with 101 or 145 hp. The base model offered two- and four-door sedans and a station wagon, while the V200 added a convertible. The Valiant Signet, meanwhile, was only available as a two-door hardtop or convertible. Nearly one-fifth of Plymouth’s half million units during the 1963 model year were Valiants. The Valiant’s grille was significantly redesigned for 1964, but the big news was the availability of the “small-block” 273-cid, 180-hp V-8 throughout the line. The same styles were available in each line and Valiant sales rose to nearly a quarter of a million cars. Options included automatic transmission, and three- and four-speed manual transmissions, as well as air conditioning. Plymouth focused most of its efforst on the Barracuda in 1965, leaving the Valiant little changed that year. The basic Valiant shape was cleaned up handsomely for 1966, with a split grille with mesh pattern. Sales dropped significantly as muscle cars gained momentum, and the slow-selling Valiant convertible was dropped. The Valiant and Dodge Dart line would be radically changed for the 1967 model year. The 1963 to 1966 Plymouth Valiants are an ideal first collector car. They are economical to buy and run, simple to fix, and they really don’t go wrong. If you can live with their Spartan interior, these cars are sensible and fun. Being an entry-level car when new, convertibles are quite rare today, but remain reasonably priced.